Magical gray horses seem to dance in an intricate display. Their riders hardly move, yet the horses perform thrilling leaps, turns and kicks, all in response to seemingly invisible signals. Is this a form of magic communication between horse and rider? Partially. These are the Lipizzaners from the Spanish Riding School, and they are evidence of the power of patient, detailed training. The Lipizzaners and their riders travel all over the world, performing demonstrations like the one in this video. Trained at the Spanish Riding School, the horses are schooled in the haute école classical equitation discipline. Their movements are based on movements that would have been required of a horse on the battlefield. The leaps and kicks could be used to defend the rider and injure an attacker. Extreme communication between horse and rider was required on the battlefield, and that discipline is what you see here. 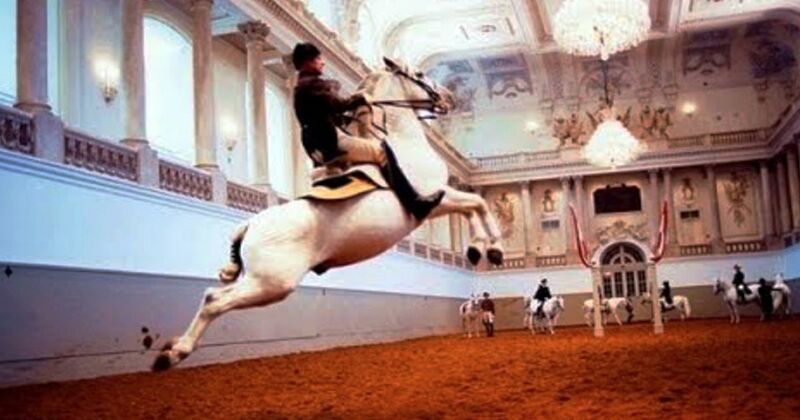 The Spanish Riding School is over 450 years old. Located in Vienna, the school seeks to study the way the horse naturally moves and to cultivate that movement through deliberate training. The school's training program is intense and disciplined, and there are strict requirements for each rider. The stables, horses and tack are kept in immaculate condition, and the school holds public shows to expose visitors to the craft. The Lipizzaner horses are special in their own right. The breed dates back to 1580, according to the school, making the Lipizzaner Europe's oldest cultural horse breed. The Federal Stud Piber carefully breeds Lipizzaners to bring out their best characteristics. The best stallions go on to perform at the Spanish Riding School, returning to stud when they are older. If you ever have the opportunity to see the Lipizzaners on tour, you should definitely go. Their displays are beautiful and are a lesson in harmonious communication between horse and rider.